The apostle, therefore, anticipates objections of this kind, when he shews, that though we are in the world exposed to dangers, we are yet kept by faith; and that though we are thus nigh to death, we are yet safe under the guardianship of faith. But as faith itself, through the infirmity of the flesh, often quails [flinches], we might be always anxious about the morrow, were not the Lord to aid us. And, indeed, we see that under the Papacy a diabolical opinion prevails, that we ought to doubt our final perseverance, because we are uncertain whether we shall be tomorrow in the same state of grace. But Peter did not thus leave us in suspense; for he testifies that we stand by the power of God, lest any doubt arising from a consciousness of our own infirmity, should disquiet us. How weak soever we may then be, yet our salvation is not uncertain, because it is sustained by God’s power. As, then, we are begotten by faith, so faith itself receives its stability from God’s power. Hence is its security, not only for the present, but also for the future. John Calvin and John Owen, Commentaries on the Catholic Epistles (Bellingham, WA: Logos Bible Software, 2010), 30. Stephen Westerholm is a helpful voice for those of us opposed to the New Perspective(s) on Paul – perspectives which have been around for forty years or so. 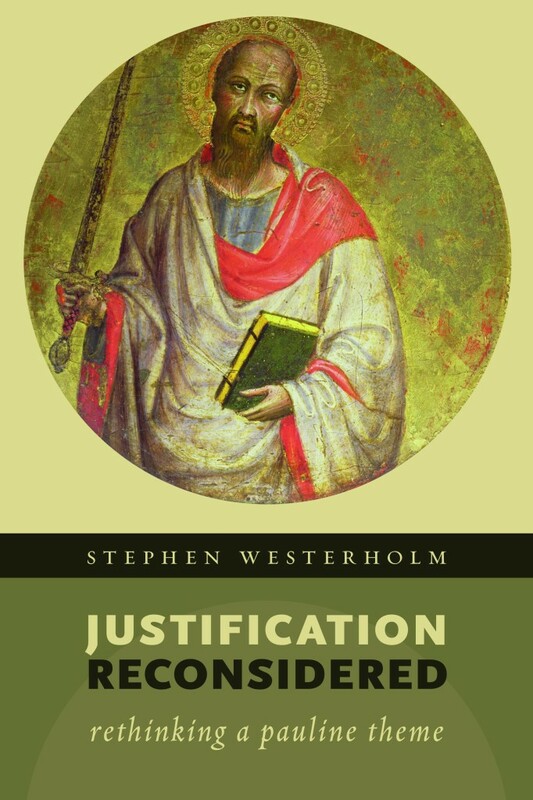 In his recent book Justification Reconsidered, Westerholm explains and critiques the New Perspective(s) on Paul and also gives a biblical defense of the historic or classical perspective. Since it is only 100 pages, this is a great book for those who want an introduction to this discussion; it is also good for readers who want to review the errors of the New Perspective(s) and be refreshed with a fine defense of the traditional view. Stephen Westerholm, Justification Reconsidered (Grand Rapids: Eerdmans, 2013), chapter 1. Great Reformation Book, Great Price! Reformation Heritage Books has Carl Trueman’s Reformation: Yesterday, Today, and Tomorrow on sale for $5.00 (for a limited time). I just ordered copies for my elders and deacons – it’ll be on our winter reading/discussion list. If you don’t have it, I highly recommend getting it! It’s not long (120 pages) but it is good, straightforward, and applicable. Calvin’s commentary on Habakkuk 2.4 is a great snapshot of what the Reformation was/is all about. He mentions how the NT relates to the OT (Paul to Habakkuk), he makes exegetical conclusions based on the Hebrew text, he points out the terrible errors of Rome, he talks about the law/gospel distinction, he shows how doctrine relates to comfort, and he ends the discussion with an excellent gospel centered prayer of hope. He also mentions what have been come to be known as the solas, specifically sola fide, sola gratia, and solus Christus. Here are a few quotes on these topics. Of course, there is a lot more to his discussion – these are just a few great quotes. In fact, I recommend finding it online (if you don’t own the commentary), printing it out, and spending ten or twenty minutes reading through it. You’ll be encouraged in the Christian faith and reminded not only of the necessity of the Reformation, but also of the beauty of the doctrines of grace. 1) The Late Middle Ages – culture, society, military, and values. 2) The Early years of the Reformations in Europe – Luther, politics, theology, and piety. 3) Luther’s contemporaries – Melanchthon, Karlstadt, and other reforms. 4) The ethical and social aspects of the Reformation (good works, vocation, and service). 5) The Reformations and the common European person. 6) The Swiss Reformation (Zwingli). 7) The Radical Reformations (the Anabaptist fanatics). 8) Later Lutheran situations and confessions (i.e. Augsburg). 9) The Genevan Reformation (Calvin). 10) The Reformation in France. 11) The Reformation in the Netherlands. 12) The Reformations in England and Scotland. 14) The many legacies of the Reformations. This book is outstanding. There are also several maps and genealogies to aid the reader in understanding the many aspects of the Reformation(s). It is around 450 pages, but to me it read almost like a novel because I am interested in this history and because it was well written. All in all, if you have around $27 that you want to invest in a Reformation history book, I’d recommend this one. In the 9th century, a Saxon monk named Gottschalk taught what is known today as double predestination. Swedish historian Bengt Hagglund explains it this way: “[Gottschalk] claimed (with some justification) that he found support for his teaching in the writings of Augustine” (p. 153). Hagglund goes on. “Gottschalk did not say…that certain persons are predestined to evil. What is rather decided beforehand is that the ungodly will receive the punishment which they deserve, just as the righteous will receive eternal life. In both cases, therefore, the right thing is done. …The atonement wrought by Christ applies only to those elected to eternal life” (p. 153). Though some defended Gottschalk, his view was condemned at a synod in 849 and he was banished to a monastic prison for 20 years. Why was he banished and his view condemned? Because, as Hagglund notes, the church of the day emphasized the freedom of the will and man’s cooperation with grace. In other words, his views weren’t appreciated because of the semi-pelagian theological context. As a side note, it is good to remember that the calvinistic Reformers didn’t make up double predestination; it wasn’t a theological novelty. Quotes taken from Bengt Hagglund’s History of Theology (Saint Louis: Concordia Publishing House, 1968).